The volume presents seventeen papers by different scholars that examine, from an interdisciplinary perspective, questions concerning meditation and yogic perception. The contributions focus on various aspects, such as the nature of consciousness, the relation of body and mind, and health, and bind together the perspectives and approaches of disciplines such as South Asian, Buddhist and Tibetan studies, religious studies, philosophy and the history of philosophy, medieval European history, anthropology and psychology. 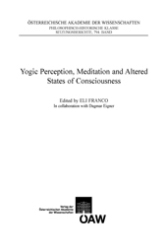 In contrast to recent interdisciplinary studies on meditation that take the natural sciences as their focal point (notably, quantum mechanics and neurophysiology), this volume uses methods established in the social sciences and humanities as tools for understanding meditative traditions, especially those found in Buddhism and Hinduism.